July 4th, I really got down to spinning on my wheel and became a spinning fool! 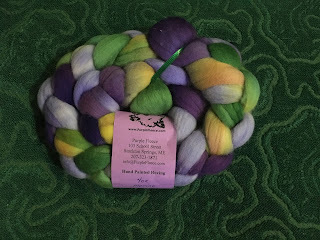 I had two braids of this gorgeous Merino in a Pansy colorway. My favorite pansies are the purple ones with the bright yellow eye in the middle. Just looking at this colorway makes me smile. It's such a happy color....and truly makes me think of pansies.. 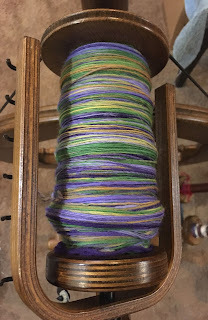 I spun the first braid during the first week of Tour de Fleece. I treated each braid differently - I'm thinking that if I make a scarf or shawl with the singles I create plied together, the long color pattern will repeat about every 1/4 length of the finished yarn. Then in each of those fourths, there will be about 5 shorter repeats of the colors. Of course, that's only if I split each just right. I split it into about 16-20 strips down the entire length of the braid. I found it very easy to spin nice and thin, and the spinning itself went rather fast. I couldn't wait to start on the second braid. 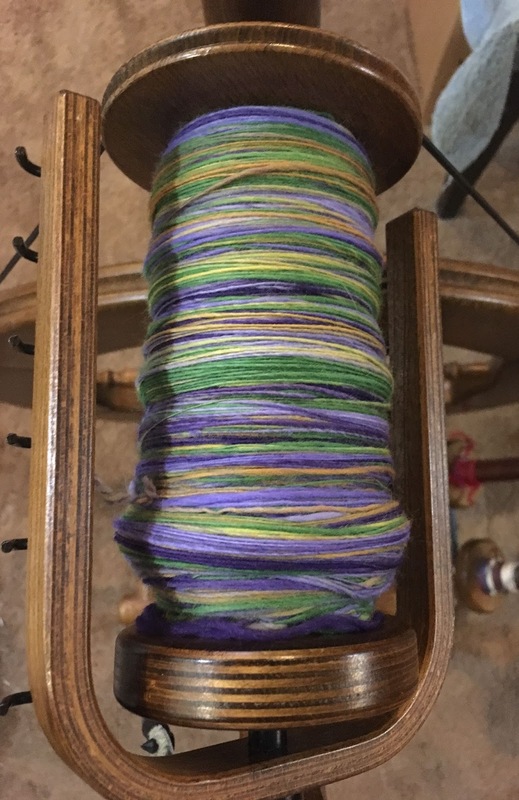 Week 2, I spun the second braid. I decided to split that braid into 4 strips that ran the entire length of the braid - much thicker strips than the ones I created from the first braid. The thicker strips weren't quite as easy to spin as I had to be conscious of the amount of fiber I fed in, else it would be too thick. The previous braid was soooo easy to spin by comparison! 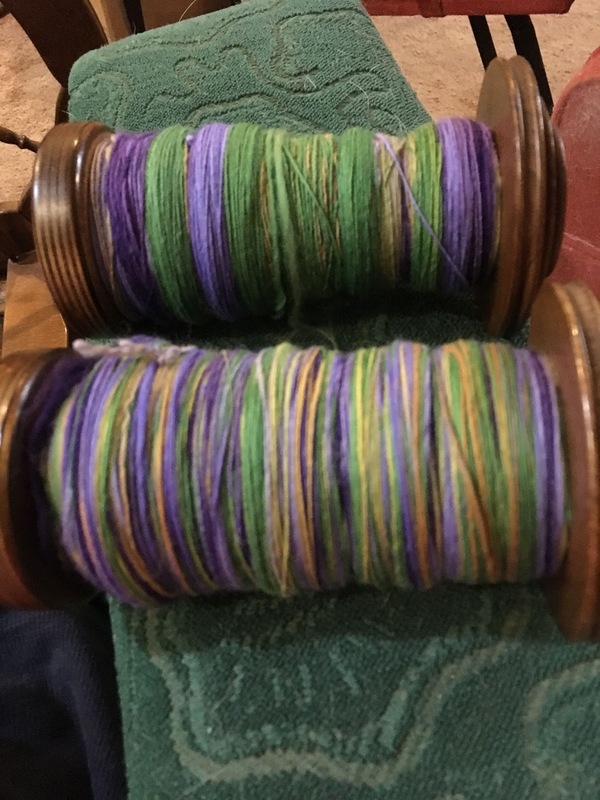 I was a bit surprised when I was done spinning - it looked like the two singles were wildly different on the bobbin. 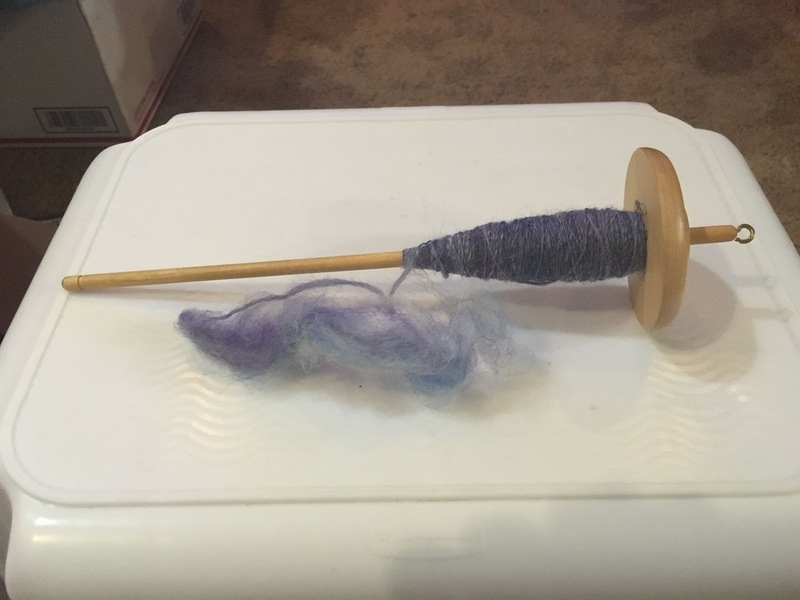 Both braids weighed the same, and I believed that my spinning was just as thin....or at least close. 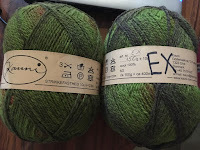 However, as you can see, the two bobbins are clearly different in size. 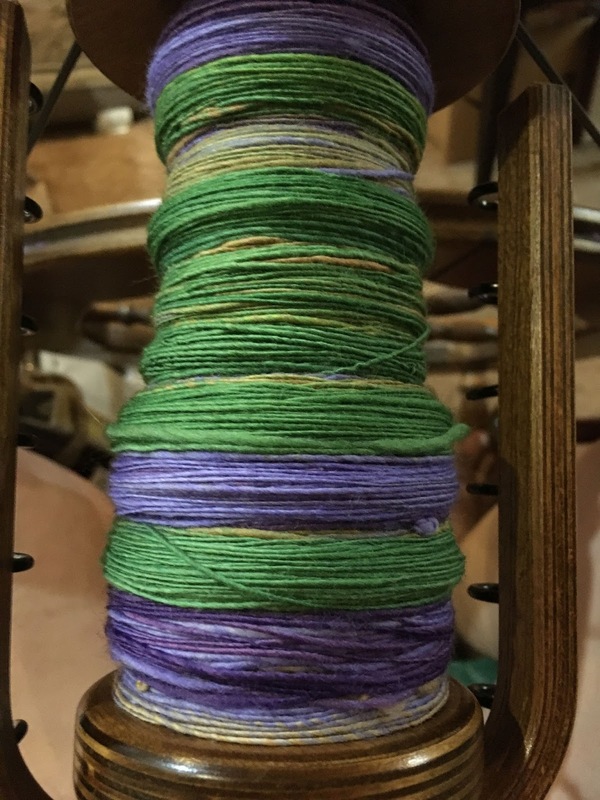 Of course, I wrote off the HUGE difference in the two bobbins as being almost 100% caused by the yarn that was on the bobbin when I started. I had quite a bit of orange singles on the bobbin that I didn't wind off before starting to spin. I assumed (and you all know you should NEVER assume.....) that was the reason that my second bobbin looked so "empty" - it had been spun on an empty bobbin, so there was no previous yarn to "plump up" the results. July has started out quite hot and miserable. What better way to "keep cool" than doing a yarn crawl. 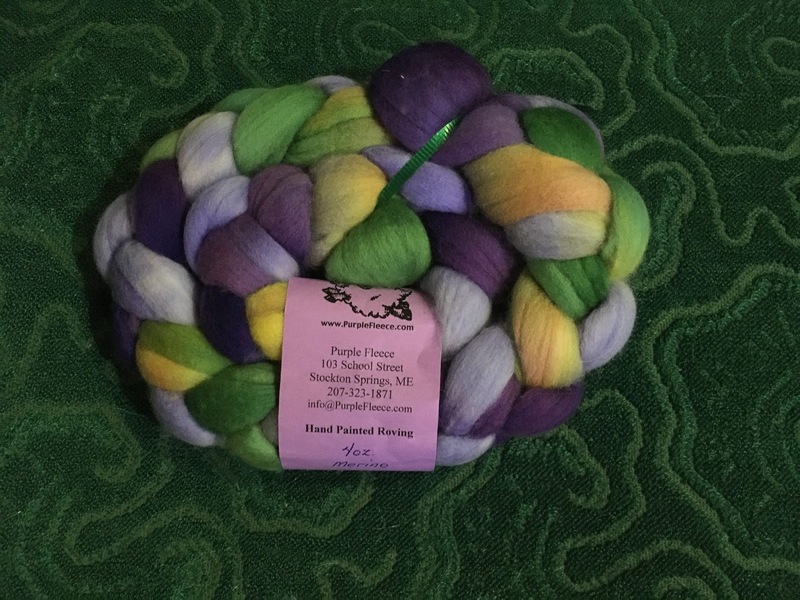 My friend Lisa and I headed off to hit a couple of yarn shops - Needles in a Haymarket (Haymarket, VA) and Hunt Country Yarns (The Plains, VA) , a cupcake and sandwich shop - Cupcake Heaven and Cafe (Haymarket, VA), and a coffee roaster - Weird Brothers Coffee (Herndon, Va). It was an awesome day! At Needles in the Haymarket, I found the most awesome project bag - in purple (of course!). 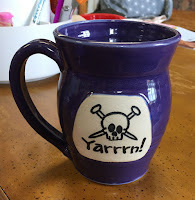 I purchased it with the birthday $$ my mom had sent me. 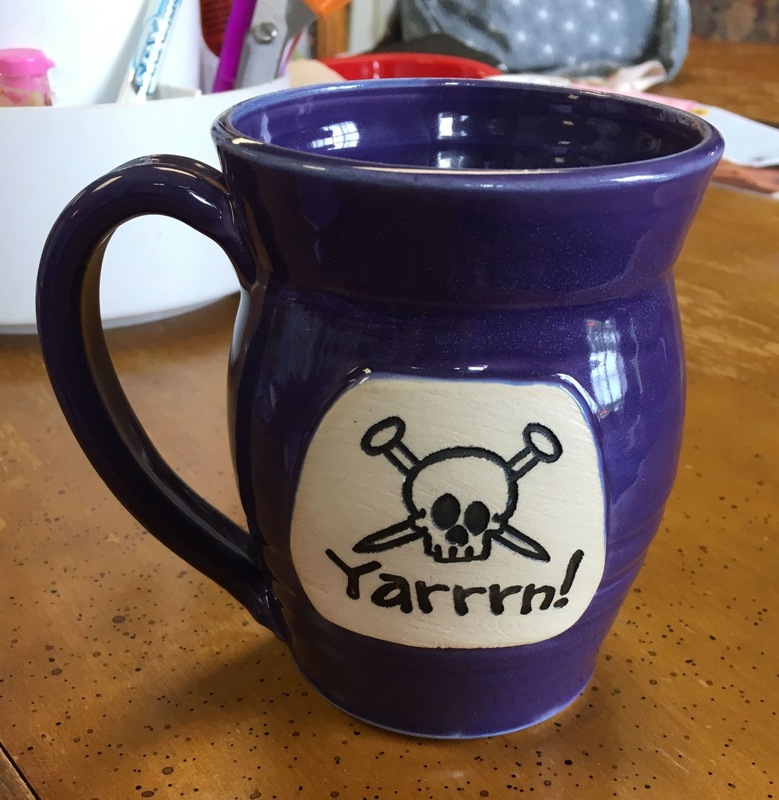 I also found a really cool coffee mug - perfect for me! Of course, to keep our energy up, we dined on sandwiches and a cupcake at Cupcake Heaven. 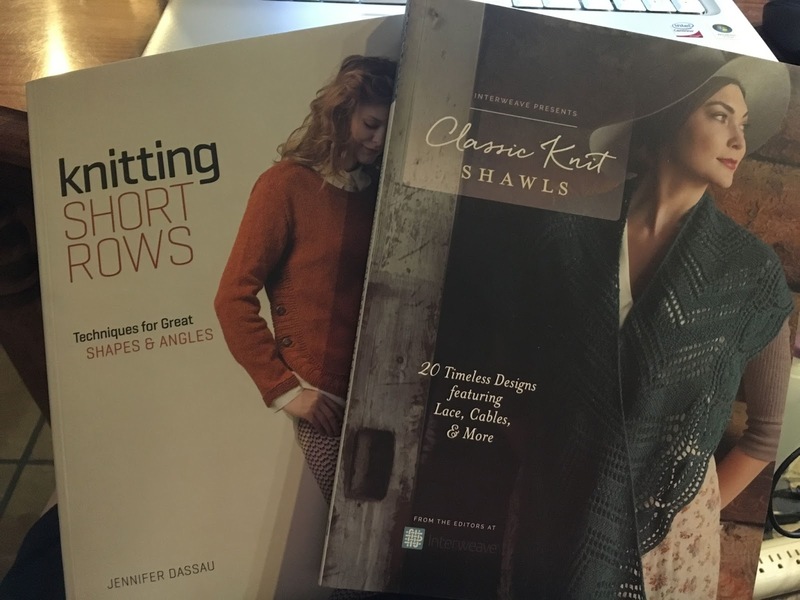 While there, I opened some birthday gifts from Lisa - two fabulous knitting books - "Classic Knit Shawls" and "Knitting Short Rows". 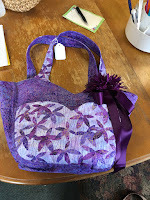 At Hunt Country Yarns, my big purchase was some Kauni EX yarn to craft the beautiful "Autumn Leaves Shawl" by Anna Stoklosa - made with knitted leaves. This yarn morphs from greens through oranges and maroons...just like the leaves in the fall, so it's the perfect choice! On the way home, we stopped at Weird Brothers Coffee in Herndon where I enjoyed a delicious cappuccino and purchased some whole bean coffee. It was sooooo much better than Starbucks! And....it's veteran owned. I got to meet both the owner and his daughter - very nice people. I'm a big supporter of eating and shopping locally. All in all, it was a perfect day...in spite of the horrendous heat and the pop-up thunderstorm!